In a surprising achievement, a team of scientists has turned diamond into graphite, using an X-ray laser. What may seem undesirable at first glance, is a decisive step forward in understanding the fundamental behaviour of solids when they absorb energetic radiation. For the first time, the researchers around Franz Tavella from SLAC National Accelerator Laboratory in the US, Sven Toleikis from DESY and Beata Ziaja from DESY and the Institute of Nuclear Physics in Krakow were able to follow the graphitization in a time-resolved manner. "In addition to these fundamental aspects, understanding the graphitization process is important for diamond-based technologies, since diamond is increasingly used for practical applications," the scientists write in the journal High Energy Density Physics. Diamond and graphite are different forms of carbon that differ in their inner crystal structure. Diamond is the high-pressure phase that forms deep in the earth. Under normal conditions, diamond is metastable, meaning that it converts back to graphite when the process is initiated with sufficient energy. There are different ways to trigger the conversion of diamond to graphite, for instance by simply heating the diamond under exclusion of oxygen or even with an aimed mechanical stroke. The other way round works as well: With heat and high pressure, graphite can be converted into synthetic diamonds that already have quite a market worldwide. 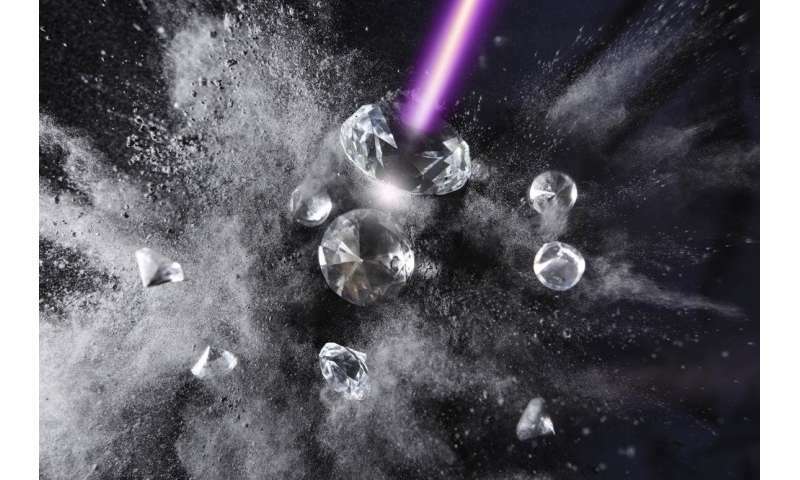 The team used the Italian soft X-ray free-electron-laser FERMI to shoot ultra-short flashes at tiny diamond slices with a thickness of just 0.3 millimetres. Usually, if you shoot such intense laser pulses at solid matter, it becomes unordered, or, as the scientists call it, amorphous. Diamond is a different example. It can switch its internal structure to a different order, thereby turning into graphite. "In principle, it was known that if you send enough energy into diamond, it should graphitize," explains Toleikis. "But it was not known exactly how this happens." There are two possible paths: the common so-called thermal transition during which the absorbed energy is transferred to the internal crystal lattice of the diamond until it re-organises itself into the graphite structure. And a non-thermal mode, where the energy absorbed by just a small fraction of the electrons in the diamond changes the internal potential energy surface, triggering a re-arrangement of the crystal lattice. "Non-thermal transition is much faster than thermal, the latter occurring on picosecond timescales," explains co-author Ziaja. A picosecond is a trillionth of a second. Additionally to the experiments, the DESY researchers Nikita Medvedev, Victor Tkachenko and Beata Ziaja had developed a computer program to simulate the phase transition in diamond induced by X-rays. "Our code predicted that it would be non-thermal, and our experiments confirmed that," says Ziaja, who works at the Center for Free-Electron Laser Science (CFEL) in Hamburg, a cooperation of DESY, the University of Hamburg and the German Max Planck Society. With FERMI's brief X-ray pulses of roughly just 50 femtoseconds duration, the scientists were able to follow the phase transition and found that it takes just about 150 femtoseconds. "It is the first time that this has been observed in a time-resolved fashion," underlines Toleikis. A femtosecond (a quadrillionth of a second) is a thousand times shorter than a picosecond. "The X-ray pulses excite the electrons," explains first author Tavella. 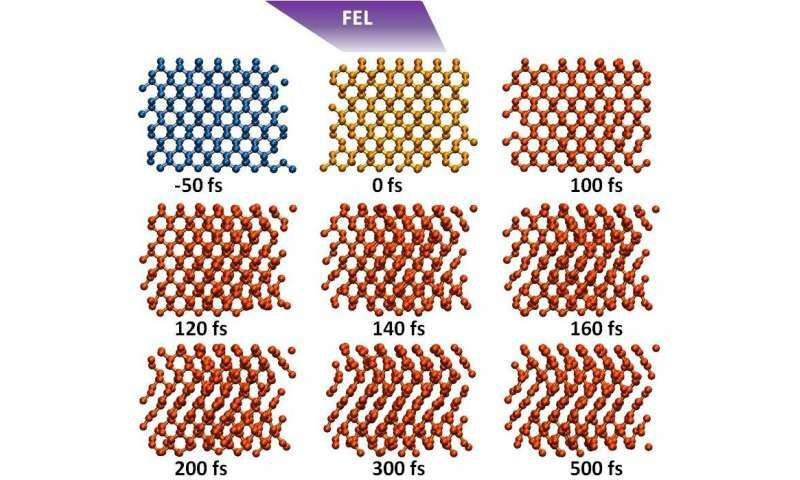 "If just about 1.5 per cent of the electrons are excited, the crystal already starts to change its internal organisation, flipping to the graphite state." The observations not only settle the question on how diamond graphitizes when excited with X-rays. They also validate the computer code used for the simulation. "We can now use the code for other materials as well. We have already made calculations for silicon and gallium arsenide," says Ziaja. "It can be used for any X-ray laser excitation experiments." Owing to the industrial importance of diamond, its stability and the question of graphitization has been investigated under various factors like high pressure, annealing and optical lasers. The advent of free-electron lasers with their ultra-short pulses now enabled the researchers to follow the phase transition on a femtosecond timescale. Photons through transparent materials, what's going on? The Standard Model's application to competing Covalent Bond theories? Energy transition in LS-coupling !